Virginia lawmakers voted Wednesday to hike gas taxes in some parts of the state to improve Interstate 81 while also voting to restore suspended driver's licenses to hundreds of thousands of motorists. The Republican-led General Assembly approved those two measures and several others proposed by Gov. Ralph Northam during a one-day legislative session. 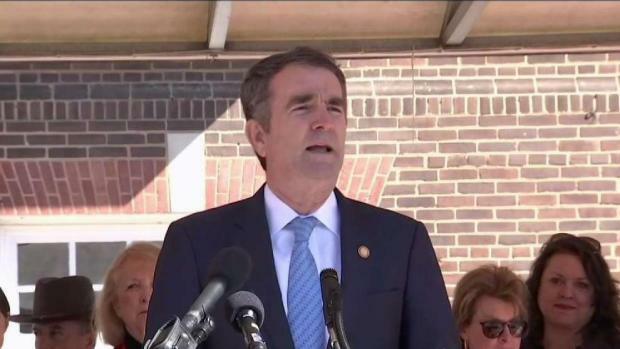 "We found common ground and made historic progress on many of the issues that have long demanded our attention," Northam said. The Democratic governor has been trying to recover since a blackface scandal nearly forced him to resign two months ago. He won praise from black lawmakers for focusing his legislative agenda on efforts to address longstanding racial inequities. Virginia Gov. Ralph Northam made his first public appearance in Northern Virginia since a racist yearbook photo surfaced and he admitted to once wearing blackface. News4 Northern Virginia Bureau Chief Julie Carey speaks with Virginia residents about their thoughts on the governor's appearance. "You can see with the legislation that we have a good working relationship," said Del. Lamont Bagby, chairman of the Virginia Legislative Black Caucus. Not all of the governor's proposals passed. Measures that failed included a proposed ban on motorists from holding cellphones while driving and extra money to bolster outreach efforts during the next census. The new funding for I-81 was one of Northam's biggest wins during the daylong session. The governor had initially pushed for tolls on the highway to pay for what he said were much needed improvements. The highway is a major artery that is vital to the state's economy, stretching 325 miles (525 kilometers) along the western part of the state and heavily used by tractor- trailers. There are more than 2,000 crashes on the road each year, with more than a quarter involving heavy trucks. There are about 45 major crashes a year that take more than four hours to clear. The push for tolls fell flat during the legislative session, but Northam was able to win support from the trucking industry and others for his proposed regional gas tax increase. The measure also increases truck registration fees. Supporters said the measure, which would raise prices on gas in areas around I-81 by about 7 cents a gallon, would also help free up spending for other highway projects. "This is something that is going to benefit the whole state," said Republican Sen. Bill Carrico. Opponents said the legislature was rushing through a tax hike without sufficient public input. "This is a major tax increase bill, let's just call it what it is," said Republican Del. Dave LaRock. Northam was also able to overcome strong opposition from key GOP House leaders and eliminate the suspension of driver's licenses for motorists with unpaid court fines and costs. The governor said earlier this year that people often don't pay court costs because they can't afford it. He said suspending their driver's licenses for the unpaid fees makes it even more difficult for them. The measure will reinstate driving licenses for more than 627,000 Virginians who currently have suspended licenses. Republicans blocked Northam on some proposals related to social issues, which are likely to be fodder for campaign messaging later this year. Virginia is one of only four states having legislative elections this year and the only one where Democrats have a realistic chance of wresting control from Republicans. Republicans upheld budget language to restrict state funding for low-income pregnant women with severe fetal abnormalities to have abortions. GOP lawmakers also voted to block Virginia from taking part of a carbon cap-and-trade program with other states without the General Assembly's explicit approval. Northam has made Virginia's membership in the Regional Greenhouse Gas Initiative a top priority of his administration.